I’m so excited to be guest posting here today! When Jenna asked me, I immediately said yes! 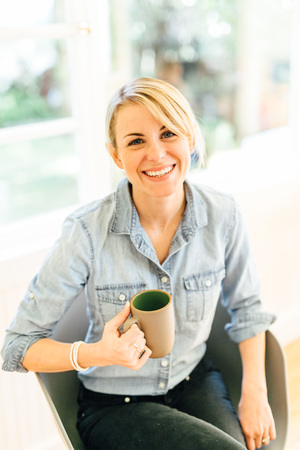 I am a HUGE fan of Eat, Live, Run and absolutely love all the recipes that Jenna creates! I’m Gaby from What’s Gaby Cooking! I started in the food world about 3 1/2 years ago when I went to culinary school. Shortly after that I became a private chef in Malibu, CA and cooked for lots of fabulous people and celebrity clients. 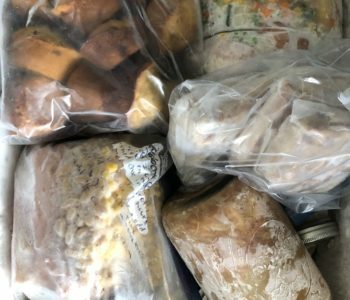 As a chef I am always obsessing over the best ingredients and am always looking for my next food adventure whether that be at my local farmers market or some country in South America where I get to explore a new food culture. Learning about different cuisines makes it easy for me to become obsessed with certain ingredients. Something usually strikes my fancy and then I’m all about it for a few weeks, creating dish after dish that features that item. 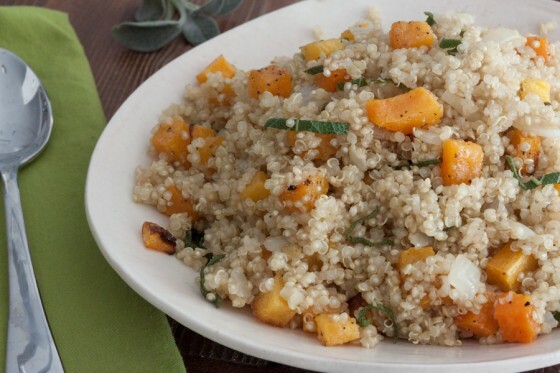 Today, I’m excited to share one of my absolute favorite healthy fall recipes for Butternut Squash and Sage Quinoa. I’m kinda obsessed with quinoa. I eat it for breakfast, lunch and dinner and mix it into all sorts of different dishes. Best part is that it’s super healthy! I’m also kinda obsessed with sage. I feel like it doesn’t get used enough, so I’m always excited to incorporate it into any of my dishes. And who doesn’t love butternut squash!? It’s just screams fall! And it’s extra delicious when roasted with a few spices! 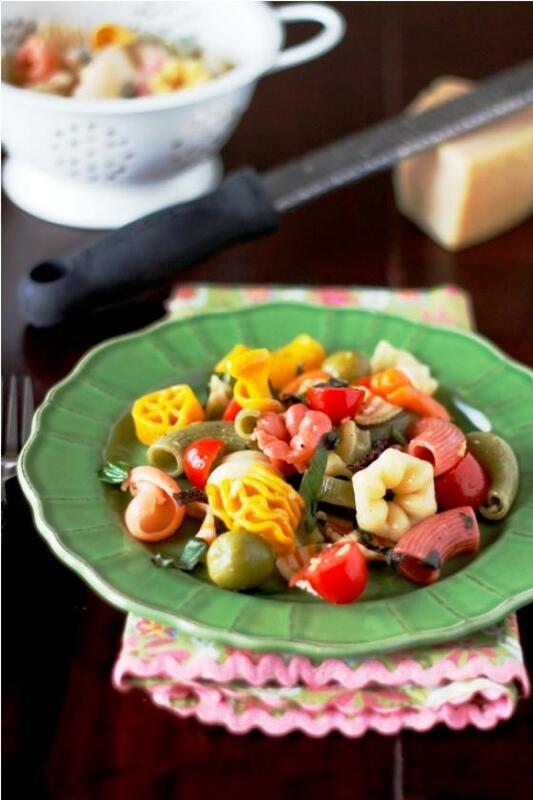 So after combining all those great ingredients you will have a super healthy and gorgeous meal. Combine the quinoa and chicken stock in a medium pot. Bring the liquid to a boil and then reduce to a simmer. Cook until the quinoa has absorbed all the liquid. Fluff the quinoa with a fork and then set aside. 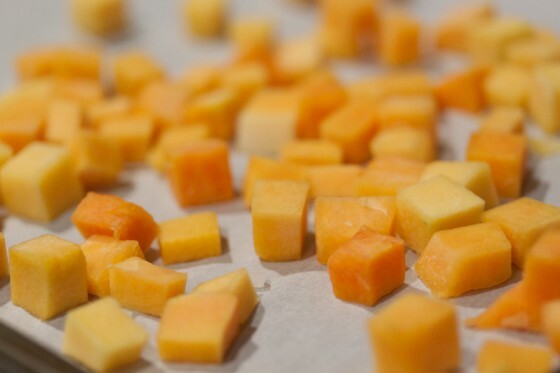 Place the cubed butternut squash onto a parchment lined baking sheet. Sprinkle with salt, pepper, garlic powder and 2 tbsp of olive oil. Give the butternut squash a quick toss to make sure the seasonings are evenly distributed on the squash. 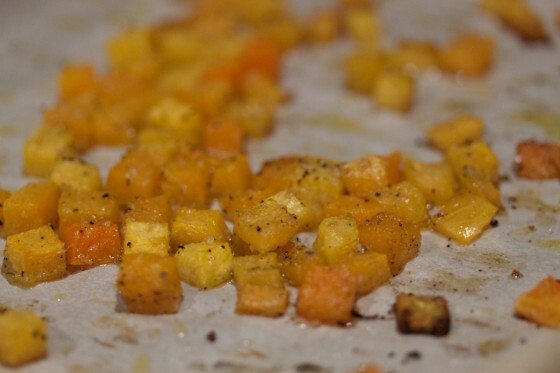 Place the baking sheet in the oven and roast for about 20 minutes until the squash is fork tender. Meanwhile, in a large skillet, add the remaining olive oil over medium high heat. Add the diced onion and garlic and sauté until fragrant. Add the sage and let it cook for about 2 Minutes. 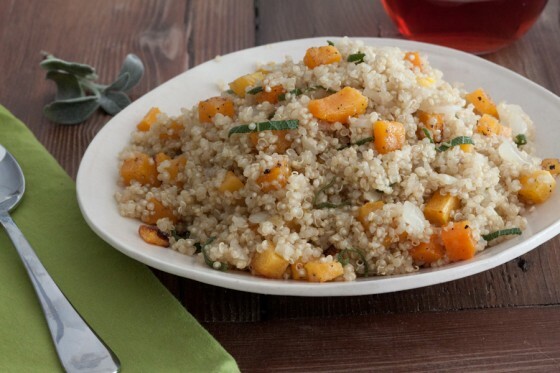 Reduce the heat to low and add the cooked quinoa and roasted butternut squash. Toss the mixture to combine and taste for seasoning. Add more salt and pepper if needed. **Thanks so much for having me Jenna! I hope you’ve all enjoyed my Butternut Squash and Sage Quinoa Salad. Feel free to contact me any time. You can also find me on Twitter, Facebook, StumbleUpon and Pinterest. You can also find more recipes and even travel/home posts on my blog What’s Gaby Cooking. I love butternut squash! Thanks for the recipe. Yum! and so easy, too! 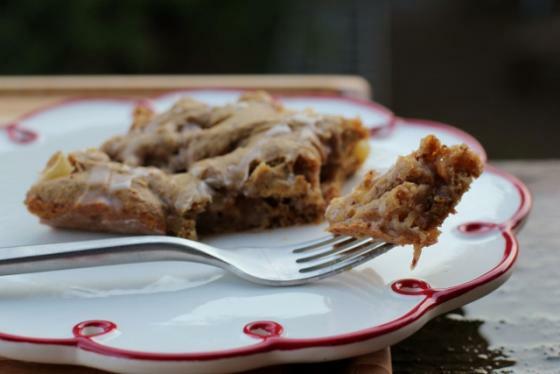 I need quinoa back in my life…this is a great recipe Jenna, thank you! Awesome post, Gaby! LOVE sage. My favorite flavors right there, yum! This quinoa is so tasty looking! Love it. LUV this salad. Luv your face. And I LUV this post! Yum! I love doing this combo with risotto. I’ll have to try quinoa! Does it say how many it serves? Can’t beat this combo! Great guest post Gaby! I still have tons of squash and sage from Thanksgiving, so I will have to try this!! Thanks, Gaby!! Quinoa is definitely something I need to work with more. I have a ton of it and for whatever reason never end up using it! I love the idea of having it for breakfast! I’ve been exploring the joy of cooking with quinoa for the past 6 months and love it’s taste, texture and versatility! 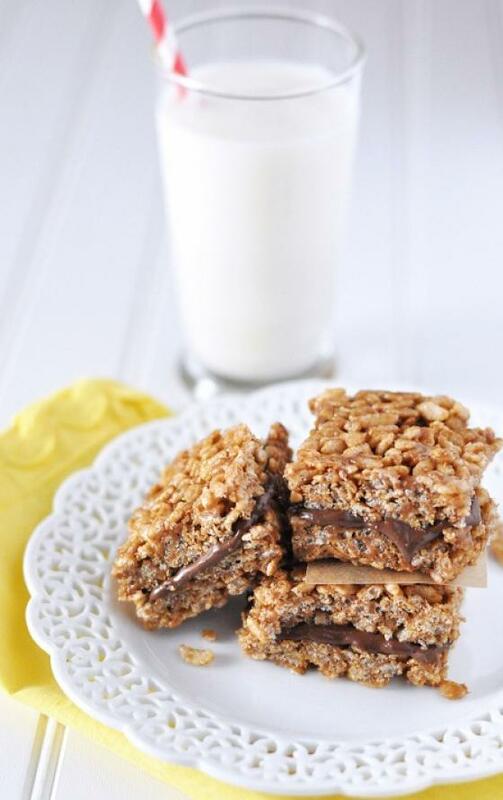 This recipe looks so delicious and I love that the ingredients are accessible and easy to prepare! Great job. I LOVE quinoa too – and always forgoet how much I adore it. It goes especially well with Feta too (but then… what doesn’t?!). I actually recently wrote a recipe for cranberry feta that tastes a LOT like stuffing and feels so seasonal. I would really really recommend it! Just picked up quinoa and butter nut squash at the store yesterday! Looks delicious! This looks wonderful and cozy! I really like bnut squash- it’s my fav squash (besides pumpkin 😉 ). I am always looking for ways to spice up my quinoa and this is perfect, especially around the Winter months. I love Sage…for some reason, it really reminds me of the Holidays. Thank you! sage and squash is one of my favorite flavor combinations. YUM. Darn it, I just used 2 butternuts that had been lying around my house all week in a soup that was less than spectacular. I knew I should’ ve held out! Oh well, guess it’s time for another trip to the store! This looks great! This looks great! I’ll have to try it out next week. This looks uber-healthy…a very nice balance to chicken and dumplings, etc. 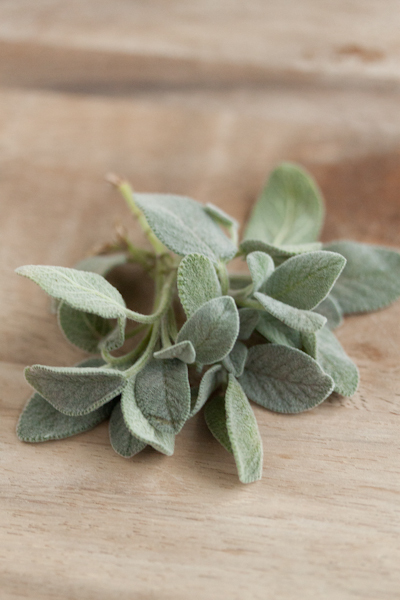 Sage is such a pretty herb,..all fuzzy and soft! OMG Gaby, I am SO obsessed with quinoa, too!!! I’m really glad I’m not the only one. I only discovered it maybe a little over a year ago but I go through phases where it’s ALL I want to eat. I just had a simple quinoa & peas with some grilled fish for dinner last night and I’m planning to try making a quinoa risotto & a quinoa scramble this weekend. However, I am gonna have to put this recipe on my list because I can just SMELL how yummy the sage and butternut squash combination must be. Thanks for the great recipe! This sounds super healthy and delicious! I agree that sage is not used enough. Or maybe I just don’t use it enough 😉 Thank you for sharing! ooh looks good =) How many serves does this one make please? I love these flavors. Perfect fall/winter meal for me. Great post, Gaby! I love this combination! It looks absolutely delicious! Wow… just what I was planning to make for dinner! I did a search for “quinoa + butternut squash + sage” and… boom! Deliciousness in an instant! The side dish for our salmon tonight! Thanks, Gaby! I totally agree about using Sage! I always forget about using it, yet when I do it always adds the nicest touch. Can’t wait to try this recipe… I’m kind of addicted to quinoa! Healthy Skin Eats | WELL in L.A. | Wellness Coaching & Cleanses - Be WELL! Just made this for dinner tonight. Soooooo yummy! Added a little lemon zest and a wee bit of fresh lemon juice. Shazam. Thanks for sharing. Your recipe was really delicious. I think I served it as a casserole. Thank you for sharing. I have recently discovered quinoa and I’m search for recipes. This one seems quite simple and delicious. Thanks a lot!